I've been using the Autolite AR3934's that came in the A429's I bought from dfree383 but I've since been told by the dyno operator and a couple racers this weekend that they are too cold a plug for my setup. I'm running about 11.4:1 compression with AV100 leaded fuel. 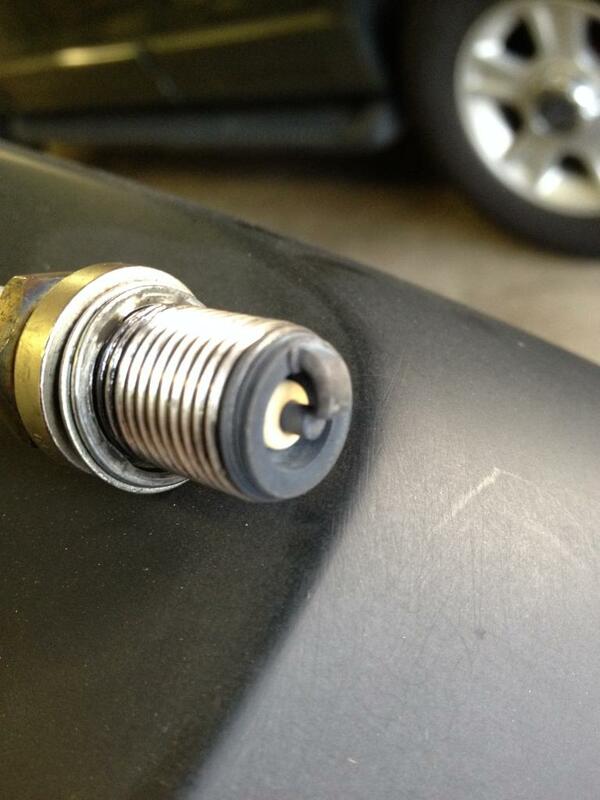 What would be a good heat range Autolite plug to buy and what gap should I use? (MSD-6AL box and blaster 2 coil) Just for a reference to the picture my 1050 domi is jetted 96/96 as it was on the dyno. Its fat as fudge at idle.... lots of soot build up. Temp of plug itself. Need more light on ground strap and better image. Almost looks perfect, but hard to tell. Ground strap should have a little blue color about to the elbow. That's really the only heat indicator, telling you if the plug is wicking away enough heat to prevent detonation and or plug burning up premature. The soot has nothing to do with heat, its tune. The engine has been idled quite a bit since my last pass on Sunday morning thanks to getting rained out and the air sucked all weekend. Very high humidity. DA was 2000+ all weekend. I'm not used to reading plugs on AV gas, always had a 50/50 mix with supreme until this year. Now I run it straight. I pulled a plug on Saturday right after a pass, my buddy thought the color was good but the first thing he said was " man those are cold plugs" I have no complaints with the engine, the Domi is a little cranky to idle until there is a little heat in the engine but it's a beast on the big end if seat of the pants feel means much. Atleast that's what I got for comments all weekend - she's pulling hard on the top end. I couldn't get a good pic with my iphone this is the best I could do. The old combo ran 10.80's in the heat, 10.60's in good air. If an engine performs good and the plugs do not foul at idle the heat range has gotta be close. Lem Evans wrote: If an engine performs good and the plugs do not foul at idle the heat range has gotta be close. This is why I'm asking - I don't know. If there is something to be gained or damage to be avoided I'll change them. Does it gas foul the plugs ? Not that I've seen. By cranky at idle I mean it needs to be about 125F before it will idol about 1200 in nuetral. Before then it wants to idle down until it dies. Run the plug you have. It's not the sparkplug's fault that the carb does not idle good. With the plugs for n2o mine would start on about 4 cylinders and require throttle pedal nursing to come up to temp. From what I've heard from other domi users at the track it's just the nature of the beast with the big carbs. My buddie's brand new Pro systems 1150 took some tinkering to get it to idle. Mine starts great and all that. I only asked about the plugs because a few of them said they looked too cold. I think David said the engine the heads came off of was a 13:1 466 and I'm not sure what fuel he was using. The plugs were new so I just left them in the heads. What kind of timing do you have at idle and how do you have your float levels set? Also how do you have the idle mixture screws adjusted? Base timing is 17* with a 21* bushing for a total of 38*. The floats are set to the bottom of the sight plugs and the idle mixture screws are 2 turns out. One of them fell out on the dyno, they don't even look at them down there at A&J. Base timing is a little low for many big cam big engines. If it starts thats fine. Idle mixture us monster fat.. I think you have excess fuel for reasonable cold start and idle. Not what we tune for. Seldom have I seen where a carb will even need the base setting of 1 1/2 turns. Most street stuff tunes in with about 3/4 turn off seat. Big carbs.. usually about 1 1/4 turns off the seat. A little more base timing will give the motor some more time to burn the fuel! I'll give it a try at the next race. This was my first race with the 1050. We didn't touch anything but the timing last weekend. Just concentrating on making clean passes to put in my weather station. Next race the air should be better and we will try some tuning. On the dyno we started with the 92/94 jets that were in the carb when I got it and then squared it down to 88/ 88 only to loose 15hp. It made the most power at 96/96. Here's a couple passes I got with the Gopro. If you can see the tach my converter is flashing at 5000 or so and I only had 3000 in the 2 step. Your carb appears to be rich in the idle circuit...One other thing, what is your fuel pressure set on? BigRigTech wrote: Base timing is 17* with a 21* bushing for a total of 38*. The floats are set to the bottom of the sight plugs and the idle mixture screws are 2 turns out. One of them fell out on the dyno, they don't even look at them down there at A&J. Put the 18* black bushing in it and both of the lite silver springs in. Edit: which springs are in the dist. now? Which ever color springs the MSD instructions said were the lightest - that's what's in it. So your saying to add base timing and put the smaller bushing to limit the total to 38? BigRigTech wrote: Which ever color springs the MSD instructions said were the lightest - that's what's in it. So your saying to add base timing and put the smaller bushing to limit the total to 38? Putting the BIGGER black bushing will let you have 3* more base timing with the same total timing. and back and forth to tech ect ect ect will play hell on plugs on a 3 circuit carb. how much of the transfer slot is uncovered in your current idle adjustment ?? how much overlap on your cam? what is vacume @ idle ? i would leave the plugs the same and work on carb and timing for sure.